Nearly $1m (£914,000) in cash was stolen from a briefcase belonging to Zimbabwe's former President Robert Mugabe, the state-owned Herald newspaper reports. Three people appeared in court earlier this month accused of stealing a suitcase containing $150,000. But according to "updated court documents" seen by the Herald, Mr Mugabe says he lost much more. Mr Mugabe, now 94, was forced out of office by Zimbabwe's military in 2017. Up to that point, he had been in power for 37 years, first as prime minister and later as president. Once famously claiming that a country could never go bankrupt, he was accused of enjoying a lavish lifestyle while presiding over Zimbabwe's economic collapse. Details of the case are emerging at a time when Zimbabwe's dire economy has seen some food prices nearly double in the last week alone. A violent security crackdown on protesters angry at Zimbabwe's high cost of living forced President Emmerson Mnangagwa to cut short a trip to Europe. The court case is ongoing, but according to the timeline of events taken from court papers and published in the Herald, Mr Mugabe took the money to his rural home in Zvimba in a black briefcase while he was president in 2016. Once there, he allegedly gave the suitcase to Constance Mugabe, a relative who also served as his housekeeper, for safekeeping. The other suspects were employed as cleaners at the time of the theft, which allegedly happened some time between 1 December 2018 and early January 2019. In March last year, four months after he had been forced out of office by the military, he reportedly asked for the briefcase, but Constance Mugabe is alleged to have said she did not know of its whereabouts. Mr Mugabe is later alleged to have asked other staff to look for it - and this was when it was found, but with only $78,000 inside, the Herald reports. "Johanne Mapurisa bought a Toyota Camry... and a house for $20,000 after the incident," state prosecutor Teveraishe Zinyemba told Chinhoyi magistrates court. "Saymore Nhetekwa also bought a Honda... and livestock which included pigs and cattle for an undisclosed amount." 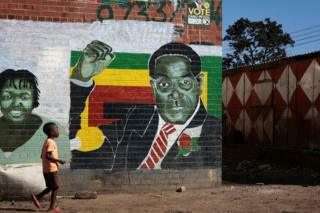 Since retiring, Mr Mugabe has had difficulty walking and has spent several months in Singapore for medical treatment. It is unclear if he was at home while the theft took place.